The Fed announced a new open-ended program of quantitative easing, along with an extension of “Operation Twist” through year end in order to achieve the Fed’s two mandates of maximum employment and price stability, while containing inflation to the 2 percent range. While the financial markets expected some form of policy easing, market reaction was swift, causing the S&P to surge 1.4 percent on the news. The Fed added that it would undertake further measures if necessary until the economy strengthens and labor market conditions improve without quantifying a specific measure of performance or duration of easing. This action reconfirmed FOMC’s view that, after three years, the economy is expanding moderately, but not enough to comfortably show progress in lowering unemployment. The EU financial crisis, recent deceleration in business-fixed investment, and other key economic measures caused the Fed to downgrade its view of economic conditions and lower its expectations for the near-term outlook. The FOMC will purchase additional agency mortgage-backed securities at a monthly pace of $40 billion for an unspecified period of time. In addition, “Operation Twist,” its program of selling short-term securities and buying long-term securities, will extend through year end, and the Committee will reinvest principal payments from its holdings into agency debt and mortgage-backed securities. These actions will increase the FOMC holdings by about $85 billion per month through year end and create downward pressure on longer-term interest rates. The Committee issued interest rate guidance as well, maintaining a zero to one-fourth point federal funds rate at least until mid-2015, to show monetary tightening would start only after economic and employment recovery is established, and noted the tightening process would occur at a more gradual pace than historical precedent. The Fed delivered a message of support welcomed by investors, and with interest rates already range-bound near zero, business and consumer sentiment may be as important as the size of the economic impact, which many analysts view as modest at best. Spending cuts and higher taxes will weigh on GDP growth in 2013, thereafter ranging between 3.0 and 3.8 percent in 2014 and 2015. The residential sector normally contributes heavily to economic recovery and growth following a recession, but now stands at a fragile juncture. This action bolsters the mortgage market, and although credit requirements are a hurdle, the Fed has removed much of the near-term interest rate risk, creating more certainty for lenders and borrowers. The commercial sector stands to benefit as well. Increased liquidity will aid in the restructuring of maturing and problematic loans and drive capital into real estate, sound alternative relative to the low-yielding bond and volatile equity markets. 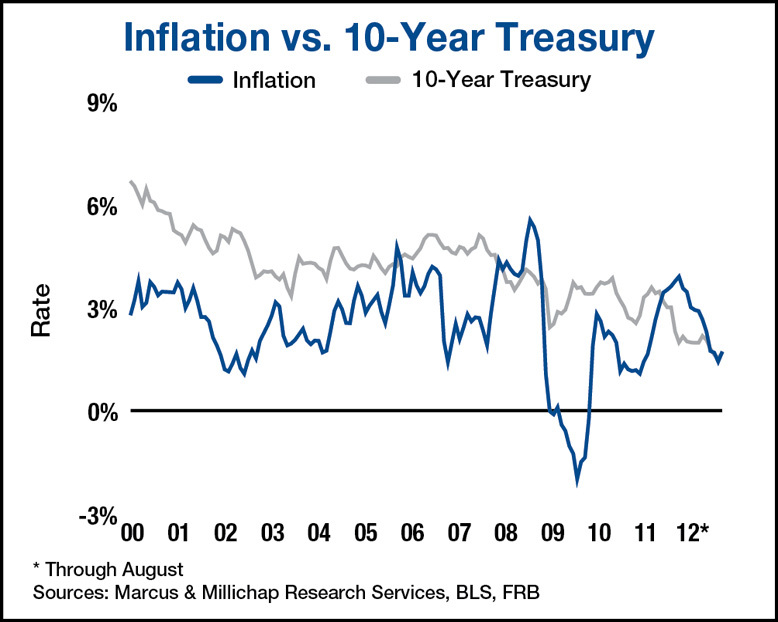 While the Fed’s statement and actions help assuage investors, uncertainty surrounding the elections, taxes and spending keeps them cautious. Commercial real estate investors trade higher prices for the greater certainty offered by top-tier markets and properties with stabilized and proven cash flows. Significant price recovery has been limited to coastal and urban core markets, and lags in markets that don’t meet the litmus test for 24-hour gateway cities, employment momentum and population growth. A more liquid credit market for sectors other than multifamily, long buffered by the GSEs, will open broader opportunities for investors. This entry was written by marcusmillichap, posted on September 15, 2012 at 1:02 am, filed under Research and tagged Commercial Real Estate. Bookmark the permalink. Follow any comments here with the RSS feed for this post. Trackbacks are closed, but you can post a comment. I’ll make sure to bookmark it and return to read more of your useful information. Thanks for the post. I will definitely comeback.